Perhaps you have heard of the amazing quality of Nevada’s onions. Maybe you have even tasted onions grown here in the shadow of the Sierra Nevada mountains. Did you enjoy the zesty flavor of the onions? Then you are not alone. Mason Valley is one of the premier onion producing areas in the world. The location in the high desert of western Nevada provides the ideal climate to grow beautiful, flavorful onions. Please try these recipes. They are unusual and delicious. Combine all ingredients in a large bowl. Serve immediately. Serves 4. Peel oranges, cutting away white membrane, and slice. Arrange orange and onion slices alternately in a bowl. Mix the oil, vinegar, sugar and salt. Pour over the salad. Sprinkle with paprika. If you wish, serve on crisp lettuce. Serves 8. Place potatoes in 1 inch of boiling water; cover and cook until tender when pierced (about 30 minutes). Drain, let stand for about 10 minutes, and cut into 3/8-inch slices. Fry bacon and crumble. Place potatoes in a large salad bowl. Add parsley and onion. Blend together mustard, salt, pepper, tarragon, garlic, vinegar, and oil. Pour over potato mixture and toss gently to coat. Add bacon. Cover and let stand at room temperature for for at least 3 hours; chill, if desired. Makes 8 servings. 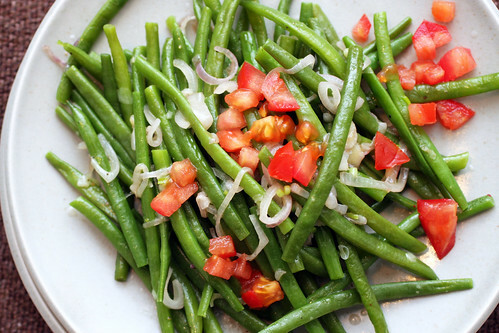 Haricot vert (pronounced ar-e-ko-‘ver) is a type of slim green beans that originated in France. They might also be called haricot beans or filet beans. It is indeed French for green beans. Haricot meaning beans and vert meaning green. French green beans are longer and thinner than most American varieties. They are also more tender and have a more complex flavor. Haricot verts are more delicate than regular green beans and cook up more quickly. For the most part, they are interchangeable with American green beans which are also called string beans or snap beans. -In a little butter with onions and fresh garden herbs. pan. Sprinkle with lemon juice, and season with salt & pepper. ‑ With Onions: lightly brown chopped onions in butter, add beans, and toss until thoroughly coated in butter and onions. ‑ With Oil and Garlic: Heat 2 tablespoons oil per pound of beans, add 1 clove finely shopped or pureed garlic, cook 30 seconds, add beans; toss until heated through. Season with salt and pepper to taste. ‑ With Mushrooms: Saute 1/4 pound sliced mushrooms per pound of beans in butter until lightly browned. Add green beans and heat through. Bring a pot of well-salted water to boil. Boil haricot vert for 3.5 minutes (yes, I honestly believe that this level of timed precision will be rewarded). Plunge them into an ice bath and drain the beans. In your empty pot (because we’re always looking to save dish-washing time in the smitten kitchen) melt two teaspoons of butter over medium heat. Add the shallot and saute them until they’re just translucent, not browned–about one to two minutes. Add the drained and cooled haricot vert back into the pot and reheat them in the butter and shallots. Season with salt and pepper. Spread haricot vert and shallot onto a plate, throw the diced tomato over them and squeeze a few drops of lemon juice* over the dish. Serve immediately. Eat with your fingers, if your name is Deb. * Please note that lemon juice discolors green beans. But only if you don’t eat them quickly, which in our case was a non-issue. a large water ice bath; set aside. beans on a kitchen towel. with the thinly sliced summer truffle. Serve immediately.